Okay friends, unfortunately, cold season is upon us. Now is a great time to adapt immune-boosting practices into your daily routine. 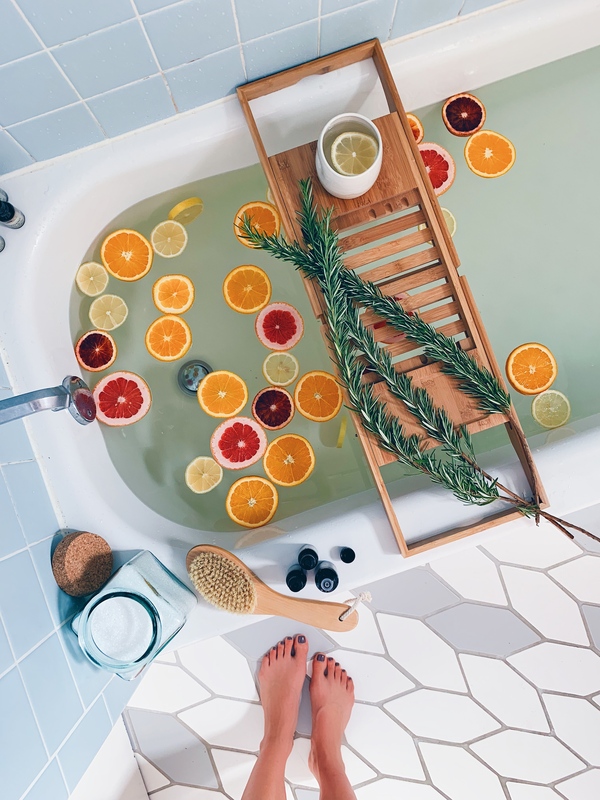 Besides getting plenty of sleep and staying hydrated, one of my favorite ways to support my immune system is with a relaxing bath using Epsom salts and essential oils. Mountain Rose Herbs is my favorite one-stop-shop for herbs, spices, essential oils, salts, teas, etc.. All of their essential oils are 100% pure, certified organic and high-quality from farm to bottle. I’ve long been inspired by MRH’s commitment to sustainability. You can read all about what they do as a business, here. 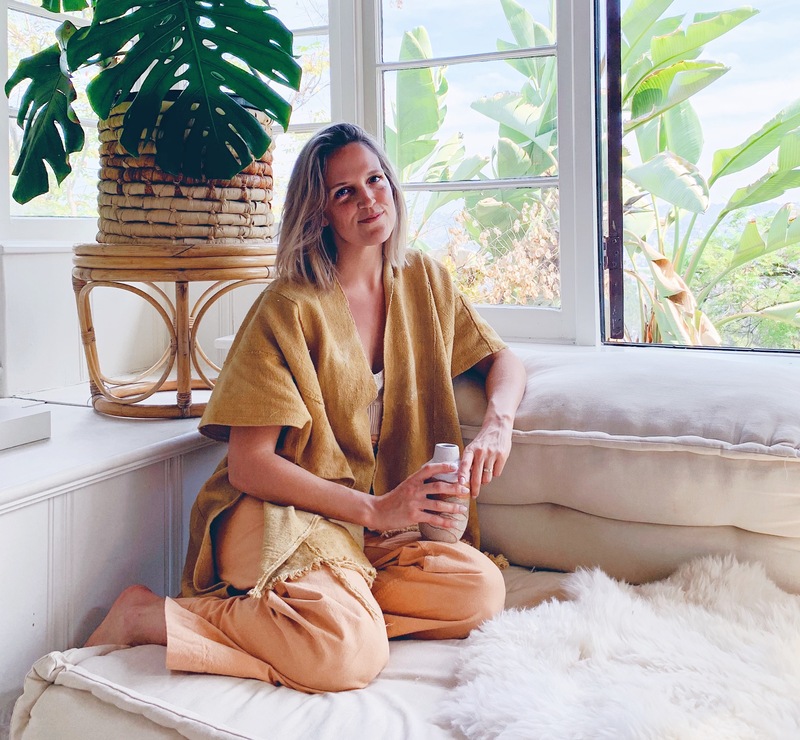 Also in this post, I’m also sharing some of my favorite tips for staying well this winter. Take care of yourselves, bbs. Eucalyptus – Known for its ability to support upper respiratory health and break up congestion. Eucalyptus is also an anti-inflammatory for the lungs. Great to use in a the bath, hot shower, sauna and/or a facial steam especially during a cold or the flu. Eucalyptus also help fight infection by stimulating antibodies. Lemon – A powerful detoxifier. Used as a lymph tonic to help move cellular waste out of the body during a cold or the flu. Rosemary – Provides a great boost to the immune system and can be helpful in loosening mucus clogging nasal passages. Can also help relieve a sinus headache. Oregano – One of the best all natural antibiotics because of its high carvacrol and thymol content. Oregano essential oil can be used both help strengthen the immune system and prevent cold and flu, or to shorten the timespan of an illness once you get sick. Cinnamon Bark – One of the most powerful antibacterial/antivirals among all essential oils. You can add a drop or two to your bath. I also love add to a spray bottle with water and use to clean surfaces in my house. Just be sure to let the cinnamon-water spray sit for 2-5 minutes on a surface before wiping dry. Clove Bud – Has antibacterial, antifungal, antiparasitic, antiseptic and antiviral properties. One of my favorite essential oils for stimulating the immune system. Frankincense – Strengthens the immune system by increasing production of white blood cells. Also acts as a powerful anti-inflammatory. In 2 teaspoon of jojoba oil (or any other carrier oil of choice), add 3 drops of oregano essential oil and 2 drops of frankincense essential oil. Massage into the soles of your feet then cover them with cotton socks to allow the oils to absorb. Plenty of sleep – This is KEY. Any time we’re worn down, overworked or stressed, our bodies become way more susceptible to illness. I always advocate for getting plenty of rest, but I find especially in the colder months good sleep is essential to staying healthy. For me that means at least 8-hours a night. Sometimes more if my body is craving it. Winter is a good time to slow down, get more rest, stay closer to home and really nurture your body and your mind. Plenty of water – Hydration is so important for every aspect of health. In the cooler months, it can be harder to get your daily water quota, so you may want to sip warm water with lemon instead of room temp or cold water. I aim for 3 liters of filtered water a day. Sometimes more when I feel like I need an extra boost. Dry brushing – Dry brushing (I do it before bathing or showering) stimulates the lymphatic system, which is part of the immune system. This helps clean the body’s tissues and maintain its balance of fluids. Our lymph nodes filter out waste, toxins and pathogens like bacteria and viruses. Dry brushing also improves skin health and appearance by increasing blood flow and exfoliating dead skin. Apple cider vinegar – One of my favorite things to soothe, and usually get rid of, a sore throat. In a mug, mix 1-2 Tablespoons of ACV with warm (not hot!) water, lemon juice and a little bit of raw honey. Sip morning and night until sore throat goes away. Vitamin C – A real powerhouse. I bolster my immune system with Vitamin C anytime I feel the slightest bit run down. 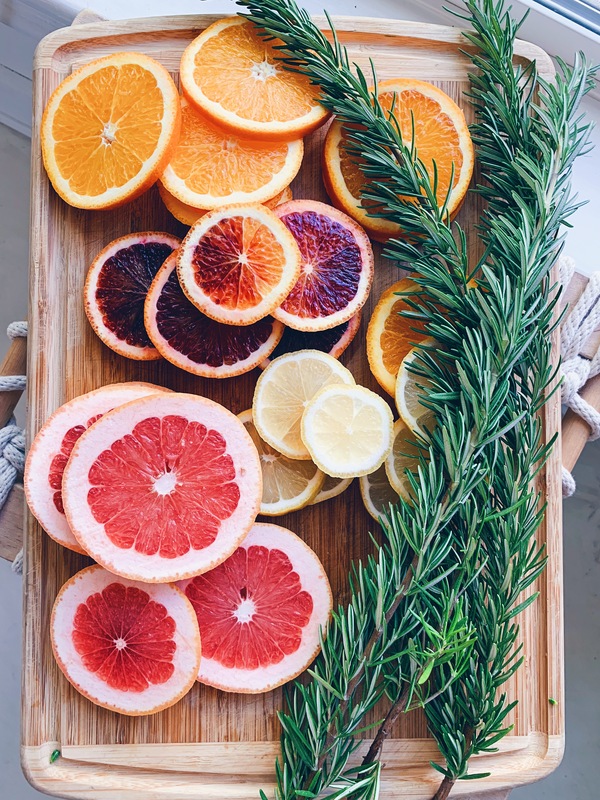 There are plenty of food sources of Vitamin C: Papaya, bell peppers, broccoli, Brussel sprouts, strawberries, pineapple, oranges, kiwi, cantaloupe, cauliflower, kale, cabbage, bok choy, grapefruit, etc. I also take this supplement when I feel like I need a little extra. Astragalus – my top choice for immunity. However discontinue use if you do actually get sick and reincorporate after getting well again. Rhodiola – best taken in the morning as it’s energizing and helps with focus. Start slowly, incorporating 1-2 into your daily routine and see how your body responds. You can always add more after a month or so if you feel called to. I recommend starting with 1/2 teaspoon of each adaptogen per day. Autumn is also a great season to incorporate warming herbs and spices. Try adding powdered adaptogens into your favorite chai recipe or into a warming bone or mushroom broth. Cut out dairy, sugar and alcohol – I don’t eat dairy or sugar normally, and I cut out alcohol completely from January – March every year. It might be worthwhile to cut one or all of these things out of your diet during cold and flu season, or at the very least, at the first signs of cold or flu. All three of these things act as immune system suppressants. Dairy also increases mucus production, which can make you feel worse if you’re fighting a cold. 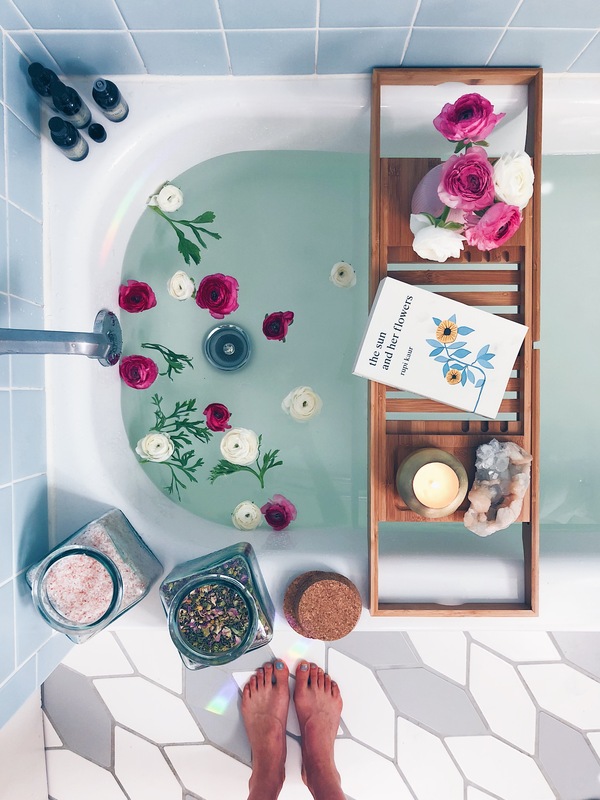 Creating a bath time ritual is one of my favorite ways to practice self care. 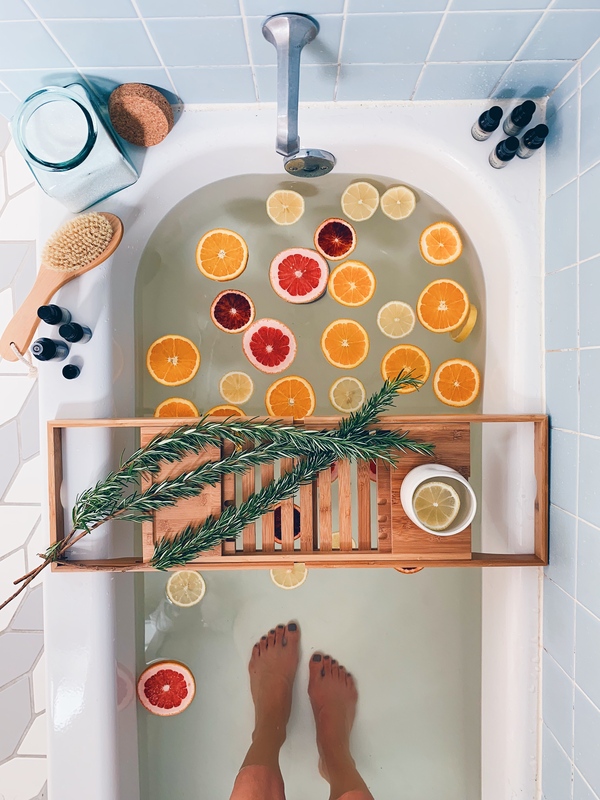 I love making over-the-top baths (proof here, here and here) and really taking the time to relax my body and my mind. There are so many amazing bath and beauty products on the market these days, but it’s really fun and empowering to make your own at home. 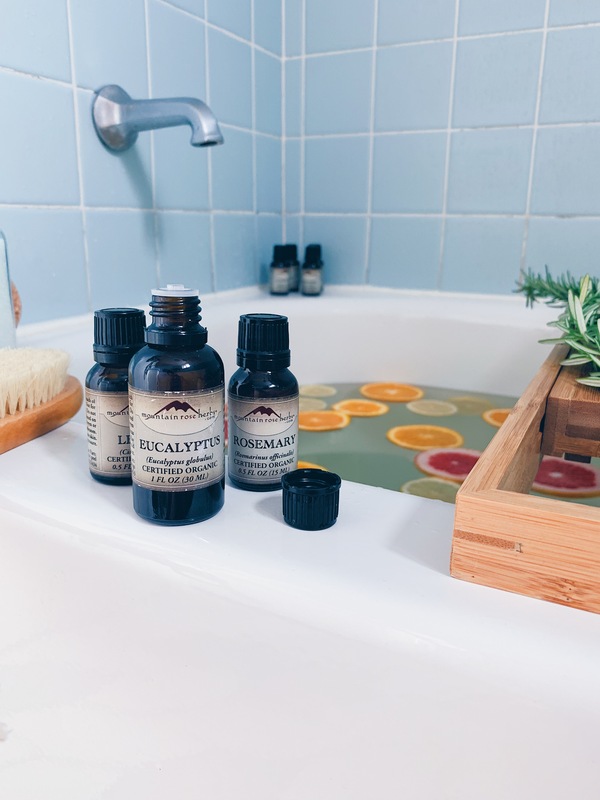 My absolute favorite resource for getting the supplies you need to make your own bath products is Mountain Rose Herbs. They have everything from essential oils and salts to carrier oils and containers to hold your homemade products. Mountain Rose Herbs is committed to sourcing sustainable and organic products, and I’ve always admired their transparency and dedication to doing what’s right. 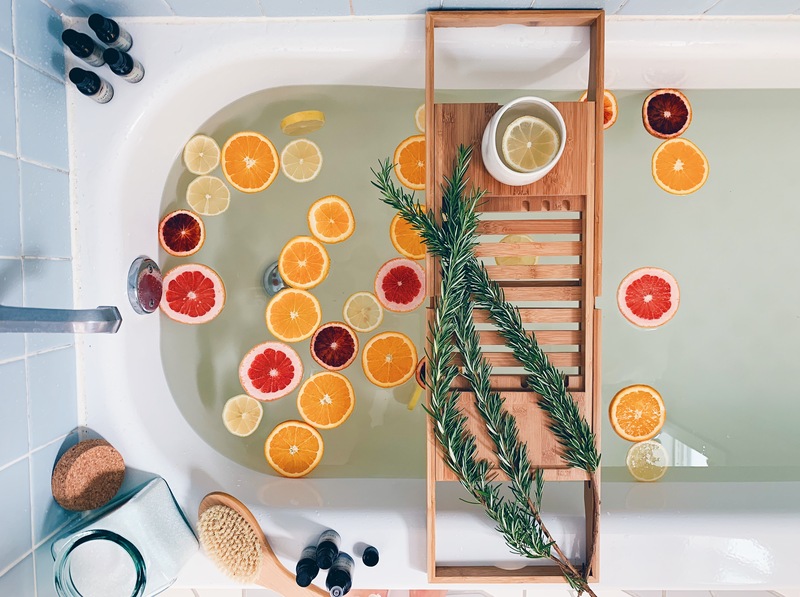 Adding flowers and citrus to a bath makes it super beautiful, but you can absolutely have the most wonderful bath without those things. 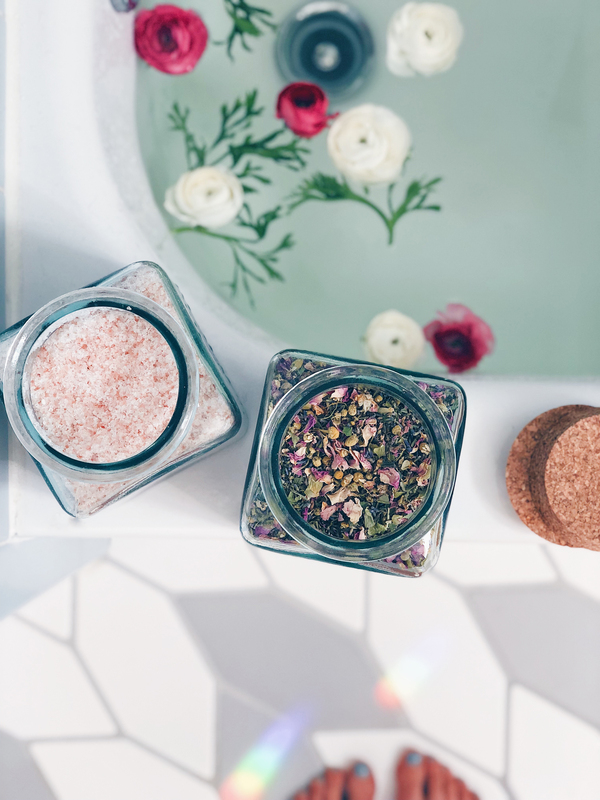 Below I’m sharing my Go-To Bath Salt Blend, as well as my Go-To Body Oil Recipe scented with my favorite essential oil blend that I’ve created. I encourage you to play around with creating your own custom scent blends too. 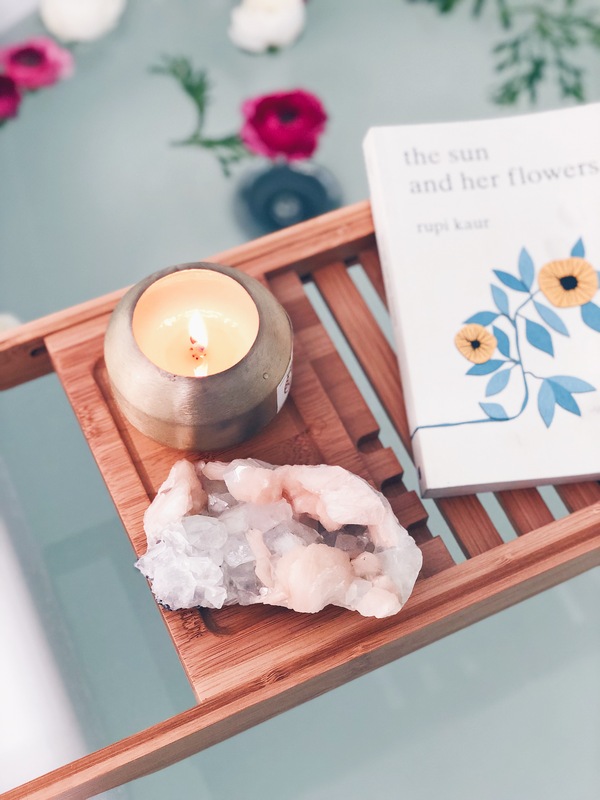 Some of my favorite bath rituals include surrounding the tub with crystals and candles, reading from a book of poetry then closing my eyes and letting my senses take over. I also love morning baths. When the sun is shining, I love to hang my rainbow-making prism in the bathroom window and bathe in the rainbow light. 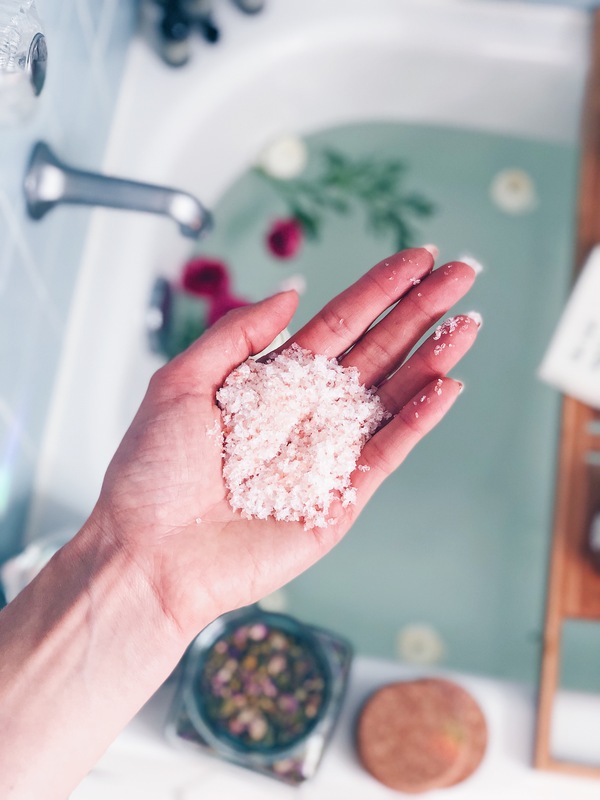 Salt baths are great for detoxification, balancing pH, easing muscle tension and soreness, stimulating circulation, combating water retention and bloat and so much more. 1.) Pour salts into a jar (I like to use these ones). Cork the jar and shake to mix evenly. Use 1-2 generous handfuls (or up to whole jar if you need) per bath. 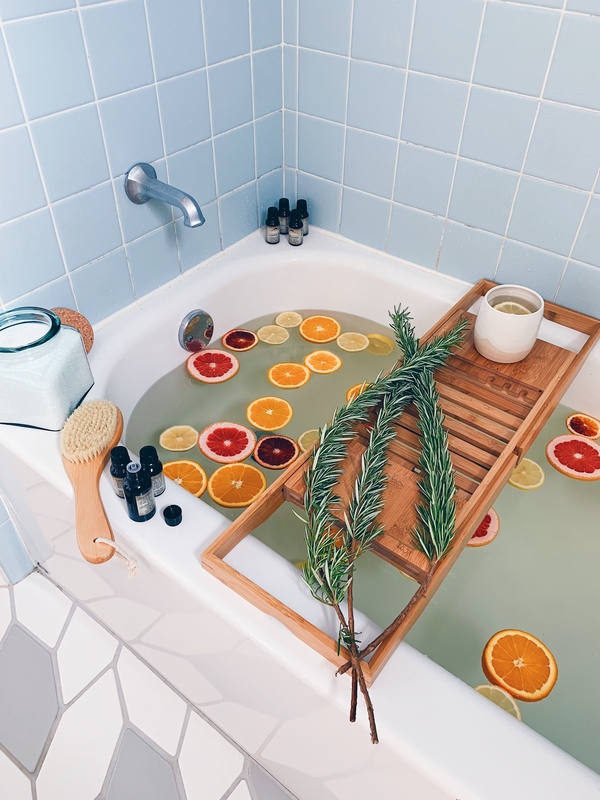 I’ve been loving these Relaxing Bath Herbs, which are basically like tea for your bath water. This blend includes chamomile, lavender, rose petals, comfrey, hops flowers, passionflower and essential oils. It comes with a reusable muslin bag that you fill and use to ‘steep’ your bath water. MRH also makes Baby’s Bath Herbs that are perfect for children. 1.) Add carrier oils to a reusable glass bottle (I use these ones) then add essential oils. Screw cap on tightly and shake until well combined. Use all over body when skin is still damp from bathing or showering.